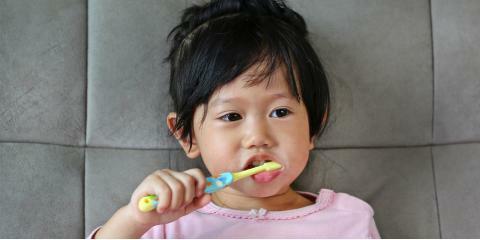 One of our biggest challenges in oral health is fighting cavities (also known as tooth decay). But what is a cavity, anyway? What happens if it’s not treated? And how can you prevent it from ever starting? Whether you like it or not, your mouth is full of bacteria. Bacteria often form a sticky film layer called plaque, which tends to accumulate near the gum line and in the deep grooves on your biting surface. When you eat, the bacteria eat the same foods as you, producing acids that break down your tooth and cause decay and cavities. When a cavity becomes too big, we need to remove the affected part of the tooth and then fill the void with a tooth-colored material called composite. Here's a short video that explains this process. Although a filling will help protect the tooth for quite a few years, no dental restoration lasts forever, and eventually it will need to be replaced. That’s why, at Hawthorne Dental, we focus on decay prevention and early detection. This includes educating our patients on good home care, encouraging regular hygiene visits, and performing exams and x-rays at regular intervals to catch small cavities before they become large ones. A common misconception is that if nothing hurts, you must not have any cavities or decay. But if your tooth is starting to hurt, it means the decay may already be deep enough to affect the nerve, which may require more time and expense to treat. So do yourself a favor and prevent decay from starting in the first place! Remove plaque and bacteria by brushing and flossing daily. Eat and drink less frequently so the bacteria have less chance to produce acids that eat away your teeth. Limit your intake of sugary foods and acidic fruits and beverages to reduce the acid level in your mouth. Use a fluoride toothpaste or rinse, or get a fluoride treatment at our office to strengthen your teeth. Have our office apply sealants to cover up those deep grooves in your teeth. Come in regularly for a professional cleaning to remove hardened layers of plaque (called calculus), and an exam to check for cavities that are beginning to form. To sum up: If cavities are detected early before they become large or close to the nerve, they are much easier and less costly to treat. But preventing them from even happening is always the best strategy! Previous Article: Hello, North Portland!